Girls are required to complete one level from 4 of the 6 areas for each branch they’re in. Levels are completed for the branch the girl belongs to and girls cannot work backwards to earn crest components from branches they weren’t a member of. The crest is built up as the girls move from Branch to Branch, increasing their experience camping and their exploration of our 2 provinces. Girls visit an increasing number of Provincial Guide Campsites through their years. This is a cumulative component (include camps visited in one branch toward challenge in the next branch). Sparks 1 camp, Brownies 2 camps, Guides 3 camps, Pathfinders 4 camps, Rangers 5 or more camps. OR attend any Provincially Sponsored Camp at your branch level. Visit a Provincial or National Park for each branch (Sparks-1, Brownies-2, Guides-3, Pathfinders-4, Rangers 5). This is a cumulative component as well (visits made as a Spark count toward visits as a Brownie, etc.). 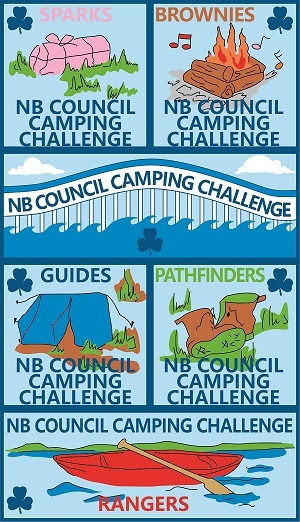 There are seven parts to the NB Council Camping Challenge crest. One for each level of Guiding and the base. The Bridge is the base that the other crests are attached to. Once the Challenge is finished, the Guider should send a note and a cheque to the Provincial Office asking for the number of crests required. The crest are $1 each. If this is the first time a girl is getting a part of the larger crest, she should get the bridge and her Guiding level crest.